An original Civil War Era mourning fan. 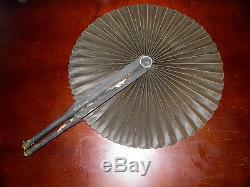 These black fans were the exact type used at funerals during this time period. 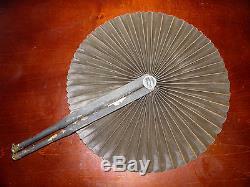 This particular fan was found at a Gettysburg, Pennsylvania Estate where it had been put away for years. It held up in very solid condition with some chipping to the original black paint and some wear to the wood. It folds out perfectly with little wear to the fan material. A nice Civil War Era mourning fan from Gettysburg. The item "Civil War Era Mourning Fan From Gettysburg Estate" is in sale since Monday, March 14, 2016. 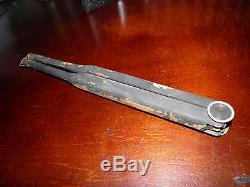 This item is in the category "Clothing, Shoes & Accessories\Vintage\Vintage Accessories\Hand Fans". The seller is "thecivilwarconservator" and is located in Dublin, Ohio.